Ohkay so, the production of Mastermind Productions, direction of Nadeem Siddique & the writing of Umera Ahmed, Thora Sa Aasman started airing on Geo Entertainment 2 weeks ago. Thora Sa Aasman is a story based on the novel that has been dramatized & aired before on PTV but this time around Geo TV has decided to bring it to us with new faces & new look. Those who’ve read the novel will definitely know that they’re in for a ride & after watching first two episodes, I had a feeling that at least in these initial episodes, they did justice to the essence of the script & I hope they stay true to it right till the end too. 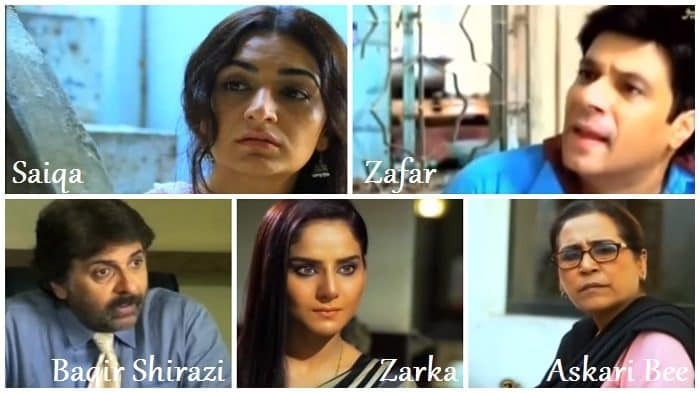 Thora Sa Aasman has a lot of characters & I am sure a lot of new faces will be introduced along the line as well, but for now they set the grounds for what is yet to come by introducing us to the main characters in the initial episodes & for that I will say that the first two episodes were directed really well & were quite impressive in terms of story-telling & character introduction. The first family of characters that we got introduced to was of Shahista Kamal (Zeba Bakhtiyar) & her husband Haroon Kamal (Alyy Khan). Shahista belongs to a humble & modest background where her parents being God-fearing people made sure that their daughters also followed the path that they saw their parents at, all their lives. Their lives turn upside down when they find out that Shahista is emotionally involved with Haroon. Haroon happens to be Shahista’s first cousin & looks like he & his father make quite a progress in their business of pharmaceuticals that too after shifting recently to Karachi. Shahista’s father (Qazi Wajid) doesn’t have a high opinion of his brother Kamal & his nephew Haroon because he feels that they don’t earn money with the legal means & also, their lifestyle & mentality is completely different which according to him is wrong. Haroon happens to be quite a ruthlessly practical person but somehow he falls for Shahista’s beauty & convinces her that he will give her the life that she has never lived & has never even imagined. Shahista falls prey to Haroon’s promises & opts for a court marriage because her parents tell her clearly that they will never allow her to get married to Haroon. 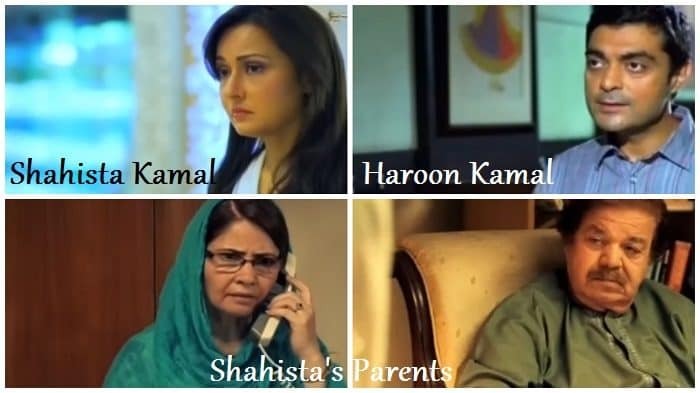 After Shahista’s decision of getting married to Haroon without their permission, Shahista’s parents find it hard to forgive her & just in a short span of time, Shahista starts realizing that her parents’s judgment about Haroon & his character wasn’t wrong. Haroon does get married to Shahista but he most certainly doesn’t believe in leading a conventional sort of a marital life. He clearly lets Shahista know that he wants his space & wants to maintain his lifestyle, therefore she shouldn’t worry much about him & to keep herself busy, she should get involved in the family business too. Shahista finds it hard to cope up with such a practical person & his thinking because this was not the sort of a marriage that she signed up for. Shahista hits the rock bottom when she spots Haroon Kamal with someone else. Haroon Kamal being drawn towards beautiful women falls for Zarka; a singer who sells her voice to make a living. Zarka’s mother warns her to not get involved with Haroon but she doesn’t pay heed to what her mother says as she finds herself falling more & more for the irresistible charm of Haroon Kamal. Then comes the family of Fatima Mukhtar (Yasra Rizvi). Fatima, a middle aged woman with an unpleasant birthmark on her face that affects her overall outer beauty & her appearance, who has never heard a good thing about herself from her family members. Fatima’s family wants her to get married but she doesn’t believe in the societal norms & believes in living a life that she would choose for herself. Fatima’s straight forwardness is often deemed as a bad behavior which then becomes a reason why Fatima drifts away from her family. Fatima comes from a lower middle class family but she dreams high, not in terms of financial security but in terms of living her life freely according to her conditions & rules. 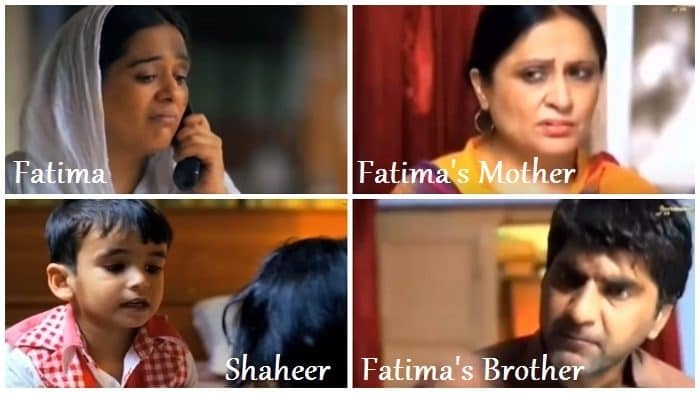 With the help of her neighbors Aasia & Azar, Fatima adopts a child from an orphanage that she names Shaheer & she leaves her mother’s house & moves to Karachi. Aasia & Azar also settle abroad & Fatima believes that no one will be able to trace her in such a big city. Fatima rents an upper portion of Askari Bee’s (Parveen Akbar) house, who happens to be a relative of Azar as well, she then starts working in a school & finds the inner peace that she never experienced when she was with her family. However, that peace turns out to be short-lived as people around her start questioning her about her child & her husband that never existed but Fatima lies about her husband being in Dubai in order to protect Shaheer. Then comes the family of Saiqa (Kaif Ghanavi), whose husband Zafar (Adnan Jillani) sends her off to her parents’ house blaming her for giving birth to 3 daughters. Saiqa’s parents already find it hard to make the ends meet & when she shows up at their doorstep, her mother tells her to start earning in order to support herself & her daughters. Saiqa takes a job at the nearby factory & finds out that she is not the only one struggling with this ordeal. Saiqa’s husband gets married & his second wife gives birth to a son, which seals the deal that there’s no turning back for Saiqa as her husband will never reconcile with her & she will have to fend for her daughters all her life, on her own. A new entry that made an appearance was of Baqir Shirazi (Qaiser Nizamani), a minister who meets Shahista Kamal at a dinner & gets attracted towards her beauty. Just when Baqir finds himself trying hard to come in contact with Shahista by questioning his manager’s wife Sabiha Jadoon about her, Haroon Kamal on the other hand gets in contact with Bariq’s manager Jadoon to find out that it is Baqir who hasn’t signed the papers to approve the consignment he has been waiting for. I am sure this would make them cross paths with each other & then Baqir would do everything to draw Shahista’s attention towards him using Haroon Kamal’s dependency on him as a bait. Another track that got a little coverage belonged to the girl named Aliya who goes to the orphanage to ask about a Safiya’s child. I am sure it must be Shaheer that she’s looking for, but let’s see. Overall, these two episodes were really good & were directed quite well too. I read the novel 2 years ago & for that reason I felt that they have done justice to the novel & the characters. Also I must say that nothing has been added & they have tried to keep things as real & as closer to the novel as possible which is a bonus. I am sure when the drama will progress we will develop a relationship with all the characters but I am most excited about the track & story of Fatima & her life because what she’s doing & what she will do is not going to be easy for her. I must say all the actors did really well in their respective characters & there are so many characters that will get introduced along the way. The OST is good to & it somehow compliments the situations that the characters are facing. I must say that I am really impressed with the way the director introduced the characters & their background stories in just these two episodes, it actually developed a strong base for what is yet to come. This story for sure is nothing less than a roller coaster ride so buckle up everyone. I am most certainly looking forward to the next episode, so please share your thoughts about the first two episodes of Thora Sa Aasman.